Though less colourful than other varieties, Black Tourmaline (also known as Schorl) is one of the most popular stones for spiritual purposes. It forms in a wide range of sizes, from the half-inch double-terminated crystals of Nepal to large Brazilian crystals of several pounds each. Some of the best specimens come from Brazil, Africa, Pakistan, and Maine in the USA. 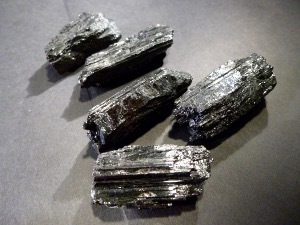 Black Tourmaline is said to be one of the most popular stones for spiritual purposes. It has been used by some to help with those experiencing high levels of stress in their work or home lives. It has also be used and may help with obsessive or compulsive behaviour, along with may help letting go of chronic worry and anxiety.